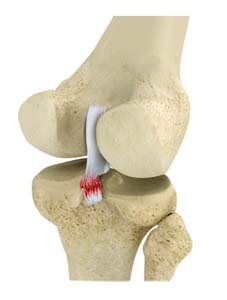 Generally, surgery is considered in patients with dislocated knee and several torn ligaments including the PCL. Surgery involves reconstructing the torn ligament using a tissue graft which is taken from another part of your body, or a cadaver (another human donor). Dr. Patel prefers a double-bundle anatomic PCL reconstruction technique, which has been shown to be superior to all other PCL reconstruction techniques. This type of reconstruction is technically more challenging, but Dr. Patel prefers it to give the best outcomes to his patients. Surgery is usually carried out with an arthroscope using small incisions. The major advantages of this technique include minimal postoperative pain, short hospital stay, and a fast recovery. Following PCL reconstruction, a rehabilitation program will be started that helps you resume a wider range of activities. Usually, a complete recovery may take about 6 to 12 months.